Karen, tell us a bit about yourself for the ChiliPepperMadness.com readers. I educate clients on the best ways to prevent disease, but even more importantly, how to take their current state of health and strive for optimal health. My hands-on approach often includes shopping field trips to grocery stores where I go aisle by aisle introducing healthy products, instructing how to read food labels, identifying ingredients that are harmful and showing clients how to make the best food selections. I often work with clients on kitchen clean outs by going through cabinets and the refrigerator identifying foods that can stay and those that need to go. I also teach clients how to create meals from whole foods. I give tips, demonstrate techniques and helps build confidence to turn out healthful and delicious homemade creations in the client’s own kitchen. Tell us about holistic nutrition. How did you become interested in it? Holistic Nutrition looks at the whole person. What they eat, where they eat, what lifestyle they follow, what they think and feel about themselves and the foods they choose to eat. As a result of a freak golf cart accident, which resulted in a broken jaw and mandible bone, I decided to change careers and follow my dream of becoming a nutritionist. My health care providers were useless in advising me on how to nourish myself through a wired shut mouth. I was malnourished through the whole healing process. 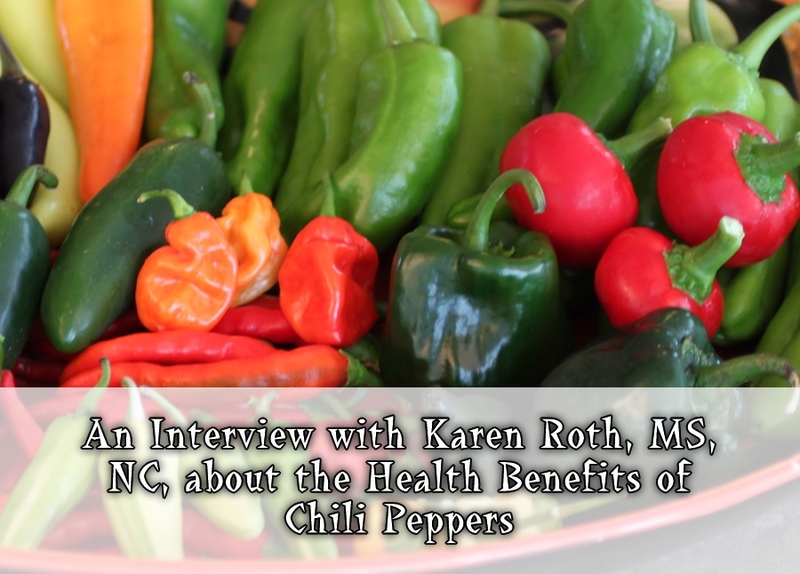 How do chili peppers fit into a holistic lifestyle? Chili peppers are a whole food and can bring wonderful flavors to many dishes. What is the first thing you tell those with whom you consult about chili peppers? Cayenne and other red chili peppers have been shown to reduce cholesterol and triglyceride levels. How do you feel people can best include chili peppers in their diets? Keep a shaker of cayenne or crushed red peppers on the dinner table. Sprinkle it liberally on all dishes. What are some of your personal favorite ways to cook with chili peppers. Any favorite recipes? I love making fresh salsa with toasted red hot Thai chilis, and guacamole with jalapeno peppers. Pepperoncini chilis are a must on salads! And my homemade tacos always include serranos. In your opinion, what are the top 5 benefits of eating chili peppers? Hot peppers may help prevent stomach ulcers by killing bacteria you may have ingested, and then stimulating the cells on the stomach lining to secrete protective buffering juices that prevent ulcer formation. The Capsaicin in peppers is similar to a compound found in many over the counter decongestants. But of course food is always better than drugs and in this case, capsaicin works much faster. Sipping a tea made with hot cayenne pepper will very quickly stimulate the mucus membranes lining the nasal passages causing drainage, helping to relieve congestion and stuffiness. For heart health. Red chili peppers can lower cholesterol and triglyceride levels. Do you feel some chili peppers are healthier than others? No, I say find the one that you like and can tolerate as far as the heat goes, and enjoy! What is your favorite chili pepper? I love the Serrano chili. It’s the right temperature for me. Any other parting thoughts or information you’d like to share with our readers? Karen Roth, MS, NC, holds a Master’s of Science Degree in Holistic Nutrition from Hawthorn University. She earned her undergraduate degree from UC Irvine. Karen shares her knowledge to empower her clients to take control of their health with food choices that best support their specific health condition. She is a believer that every ill health condition can benefit and possibly improve from a solid foundation of healthy foods choices. Karen maintains a clinical nutrition practice in Valencia and Sherman Oaks, California. She consults with clients on a local and national basis. Learn more about Karen and her work at http://www.karenrothnutrition.com.